In early December, an enthusiastic group of fifteen girls and three teachers embarked on a journey to Cambodia. Our ultimate goal was to raise money and awareness for Hagar our charity, but also to achieve a personal goal we set for ourselves – running a half marathon around the majestic temples of Angkor Wat. After many months of baking cookies, cakes and muffins, movie nights and long runs around the Tan, we left a mild summer’s day here in Melbourne for the severe heat and humidity of Siem Reap. With all of the money we raised from our families, friends and all of you who ate our cookies, watched the movies or just donated a gold coin to this great cause, we left Australia with over $24,000 to donate to Hagar. It was an amazing feeling, hoping that we might be able to do something to change another person’s life. Extract from a presentation given by Eliza Mills, one of the students who participated in Run for Freedom in, 2017. 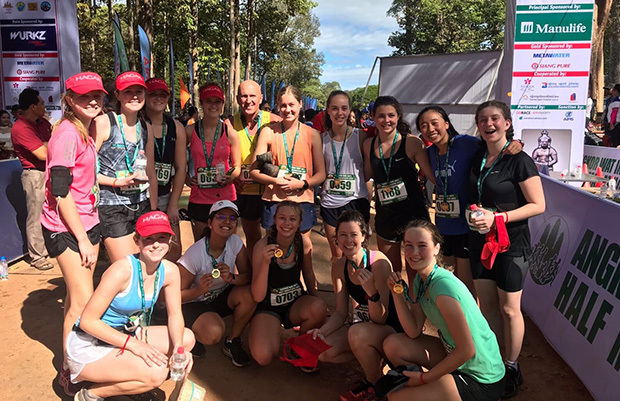 On behalf of us here at Hagar Australia thank you to the following who participated in Run For Freedom and helped raise vital funds to transform the lives of women and children in Cambodia: Alice Dimitroulis, Eliza Chantrell, Eliza Mills, Ella Porter, Gaia Charan, Isabelle Dudley, Julia Henham, Lexi Kelsall, Lottie Molnar, Mia Waring, Rachel Chen, Sabrina Smith and Sarah Shand. Learn more about how you can get involved in Run For Freedom 2018.